Thanks to a book I finally found called Where’s Mom Now that I Need Her (still in print because it’s a classic! ), I finally learned to master the grown-up world of meal preparation and stain removal. I still recommend this book for easy “how to live on your own advice”, but I eventually built up a repertoire of meals as a young adult that fit my own personal standards of what makes a gourmet meal. Super Quick. Forget 30 minutes. A meal has to be ready in less than 15 minutes from start to finish. Easy to make. I didn’t want to have to look up a recipe for every single thing so I tended to stick with meals that didn’t require precise amounts. 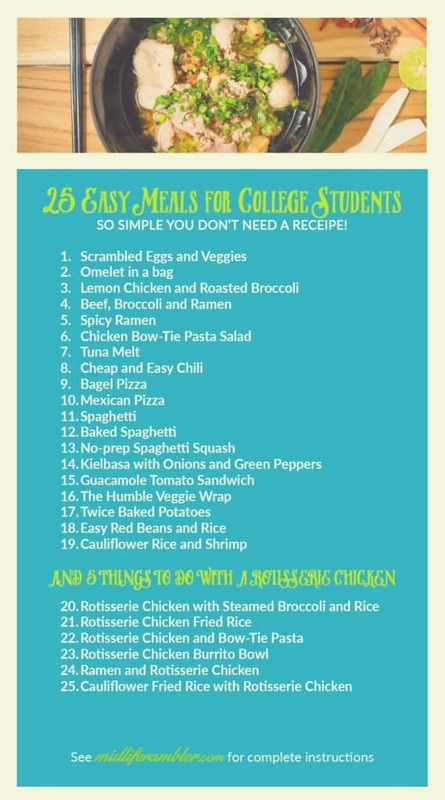 So to help out my daughter, her roommates and any other confused young adults in the world, I’ve dug into my memory and compiled a list of meals that are so simple you don’t even need a recipe to make. All these meals are quick (except for a few which require some time for hands-off simmering and baking), easy, inexpensive, use as few ingredients as possible and healthy. Most take advantage of pantry items that are useful to always have on hand so there’s little, if any, pre-planning at all. And all the meals are tasty. Scrambled Eggs and Veggies. Eggs are a great high protein choice for any meal. Add veggies and it’s the perfect meal. Start by sauteing onions and green peppers, then add in diced tomatoes before scrambling the eggs in with the veggies. Omelet in a bag. Another great egg choice for any meal. Take two eggs and crack them into a zip-lock bag. (I know!). Squeeze the bag a bit to mix up the eggs and add some onions, peppers, and/or ham. Put the bag into a pot of boiling water and let it sit for 5-10 minutes until the egg has omelet texture. Lemon Chicken and Roasted Broccoli. Marinate 1 lb boneless chicken breast in 1/4 cup olive oil and 1 cup lemon juice with salt and pepper to taste. While the chicken marinates, preheat the oven to 450 degrees and toss fresh broccoli with olive oil, garlic salt, and pepper. When the oven is preheated, roast the broccoli on a cookie sheet for 20 minutes and saute the chicken until no longer pink. Beef, Broccoli, and Ramen. Cook Ramen noodles as directed. Brown the ground beef with 1/2 the seasoning packet from the ramen noodles. Add in broccoli and the second half of the packet and cook for another 5-10 minutes. Stir in the ramen noodles with a bit of soy sauce for the final minute. Spicy Ramen. Prepare Ramen (without spice packet) as directed. Mix together 1 tablespoon Soy Sauce, 1 tablespoon Brown Sugar and 1 tablespoon Sriracha. When noodles are done, mix the noodles together with the sauce. Chicken Bow-Tie Pasta Salad. Cook 1/2 box bow tie pasta and add in cherry tomatoes and steamed broccoli. Toss with Italian salad dressing. Top with grilled chicken. Tuna Melt. Toast 2 slices of bread while you mix up water-based tuna and mayonnaise. You can also add cut-up celery and a bit of balsamic vinegar if you’re feeling fancy. Spread your tuna mix on one piece of toast and sprinkle 1/4 cup shredded cheddar cheese on the other piece. Toast for 10 minutes or until cheese is melted in a 350-degree oven or toaster oven. When the cheese is melted, assemble your sandwich and enjoy while watching a rerun of your favorite childhood sitcom. Cheap and Easy Chili. Brown 1 lb ground beef and 1/2 diced onion in a medium-sized pot. Add 1 can of diced tomatoes, 1 can kidney beans, 1 can tomato sauce, 1 1/2 teaspoon chili powder. Simmer for one hour or until it seems done enough and you just can’t wait anymore. Top with shredded cheese and the Fritos we both know you have hidden in your pantry. Bagel Pizza. Cut a bagel in half and cover both halves with pizza sauce (or spaghetti sauce, I won’t tell) and add your choice of toppings and shredded cheese. Bake in a 425-degree oven until the cheese is melted – about 5-10 minutes. Mexican Pizza. Just like bagel pizza but with a tortilla base. These are especially delicious if you first spray the tortilla with some olive oil and bake in a 425-degree oven for 5-10 minutes until crisp. You can then add the toppings and pop back into the oven for another 5 minutes or until the cheese is melted for an easy taste treat. Spaghetti. Cheap and can be made so quickly. Toss spaghetti noodles in boiling water for about 10 minutes. (Turn down the heat when you put the noodles in so the water doesn’t overflow.) Cook 1 lb ground beef along with minced garlic and diced onions and then add spaghetti sauce and set to simmer for 15-30 minutes. Top with mountains of cheese and enjoy the melty goodness. Baked Spaghetti. An easy twist on classic spaghetti! Basically, make spaghetti as described in #1q but then combine the ingredients into a casserole in the following manner: layer 1/3 of the noodles in the bottom of a casserole dish and then top with 1/3 of the sauce. Continue layering like this for two more rounds and then top with a generous amount of cheese. Bake at 350 for 30 minutes or until the cheese looks nice and melted. No Prep Spaghetti Squash. (OK, there’s some prep, but hardly any.) Using your sharpest knife, cut a spaghetti squash in half lengthwise. Scoop out the seeds and then drizzle both halves of the squash with olive oil. Add salt and pepper to taste. Place cut-side down on a cookie sheet lined with aluminum foil and cook in a pre-heated 375-degree oven for about one hour. Scoop out the strands of the squash and eat as is with a little bit of added butter or be super decadent and cover with spaghetti sauce and cheese for the ultimate healthy comfort food. Kielbasa with Onions and Green Peppers. Slice up a sweet onion (get Vidalia onions if they’re available, otherwise any sweet onion is fine) and one green pepper. Saute in 1 tablespoon olive oil until the onions are soft, then add in 1 sliced Kielbasa sausage and cook until the sausage is warm all the way through (around 5 minutes). Guacamole Tomato Sandwich. The perfect summer sandwich. The trick to making this into a meal and not just a sandwich is to use some really good sourdough bread. You can use any sturdy bread for this, but be aware that regular white bread might collapse under the weight of the ingredients. Toast the bread, smear on some guacamole and top with a sliced, fresh tomato. Season with salt and pepper and enjoy the awesomeness. The Humble Veggie Wrap. Filling, delicious and good for you, this sandwich takes just seconds to prepare. Take a tortilla and smear some hummus on it. Top with fresh spinach, sliced avocado and cut up bell peppers. Twice Baked Potatoes. A meal in a spud! Cook a baked potato in the oven for an hour at 400 degrees or in the microwave for around 10 minutes. (Be sure and pierce the skin of the potato with a fork before baking so it doesn’t explode!) Let the potato cool for around 10 minutes and then cut it in half and scoop out the inside into a mixing bowl. Add in 1/4 cup shredded cheddar cheese, 1/4 cup softened cream cheese, and add salt and pepper to taste. Spoon the mixture back into the potato and then bake for 20 minutes at 400. Easy Red Beans and Rice. Cook rice according to the directions on the box. Cook cut up kielbasa for 5 minutes in a skillet and then add diced onions and green peppers. Cook until softened. Add one can kidney beans and one can diced tomatoes. Add salt and pepper and serve over the rice. Cauliflower Rice and Shrimp. I love Trader Joe’s Fresh Frozen Shrimp. It’s low-calorie, delicious and makes every dish a little bit special. Pair it with their pre-cut cauliflower rice and you’ve got an easy gourmet meal. If you don’t have a Trader Joe’s nearby, you might still be able to find pre-made cauliflower rice; I’ve seen it a few other grocery stores around here. And, of course, every grocery store has frozen shrimp. Just make sure to buy deveined shrimp or you’ll have a lot of extra work up front. Here’s a quick and delicious meal using both ingredients: Saute a sliced onion until tender and then add a cut up bell pepper and a bit of garlic. Stir-fry for about 5 minutes and then add the cauliflower rice. Add a bit of broth – just enough to make the rice moist and a bit of turmeric to add a lovely color and flavor to the rice. Top with thawed shrimp and cook until heated through. Yummy! Rotisserie Chicken with Steamed Broccoli and Rice. Store-bought Rotisserie chicken is the gift that just keeps on giving. Pick one up at your local grocery store and eat it the first day as is with a side of roasted broccoli. (Place the broccoli on a cookie sheet and lightly mist with olive oil. Add salt and pepper to taste and then roast for around 20 minutes in the oven at 450 degrees.) Add a serving of rice (follow instructions on the box) and make enough broccoli and rice to use the next day in Rotisserie Chicken Fried Rice. Rotisserie Chicken Fried Rice. The perfect way to use up any leftovers from a Rotisserie dinner. Lightly scramble 2 eggs and then remove from the skillet. Add 1 tablespoon olive oil and stir fry 1/2 diced onion, cut up bell peppers and roasted broccoli for 3-4 minutes until vegetables are softened. Add 1 cup cooked rice and 1/4 cup soy sauce and stir-fry until heated through. Stir in the scrambled eggs for one minute and serve. Rotisserie Chicken and Bow-Tie Pasta. Another great way to use leftover rotisserie chicken. Prepare half of a box of bow-tie pasta. Drain the pasta and return to the pan with the burner on medium. Add 1 cup shredded chicken, 1/2 bag of frozen peas, and 1/2 jar alfredo pasta sauce. Stir until everything is warm and covered with sauce, about 5 minutes. Rotisserie Chicken Burrito Bowl. Prepare rice as directed and then squeeze the juice of 1/2 lime and some finely sliced fresh cilantro into the rice. Add ALL THE VEGGIES: 1/2 can black beans (drained), 1/2 can corn (drained), sliced green and red peppers, 1/2 can diced tomatoes (drained), and shredded romaine lettuce. Top with shredded rotisserie chicken and maybe a bit of shredded cheese and sour cream if you’re feeling indulgent. Ramen and Rotisserie Chicken. Two great tastes that go great together. 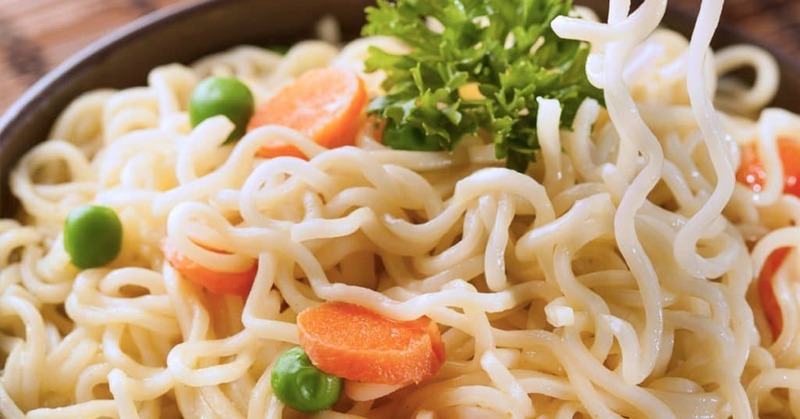 Cook a package of ramen noodles in 1 cup chicken broth. Add sliced green onions, 2 teaspoons soy sauce, 1/2 boiled egg, and shredded leftover chicken. Cauliflower Fried Rice with Rotisserie Chicken. Saute diced onions in 2 tablespoons olive oil until tender and then add the cauliflower rice (see #19). Stir-fry for about 5 minutes before adding 1/2 bag frozen peas and shredded rotisserie chicken. Add 2 tablespoons soy sauce and stir-fry for another 5 minutes. Beat 2 eggs in a bowl and then pour on top. Continue stir frying until the eggs are cooked through. This could not have come at a better time! On Saturday I got a text from my son who is a sophomore in college, “You can only eat so much pasta.” Ha! Sending him this link. And pinning it to My Daughter’s Freshman Year board. She graduates from HS in May. Thanks so much!